“The government is being unfairly accused of delaying appointment of judges while we have done our best. We appointed 120 judges to the High Courts this year, the second highest so far. 121 was appointed in 2013. This is against an annual average of just 80 appointments since 1990. We are saying this after pulling out records since 1990”, Law Ministry source. In a fresh round of tiff over “delay” in judges appointment, the Law Ministry today took objection to Chief Justice T S Thakur’s criticism of the government on the issue at a time when it was “doing its best”. Significantly, highly placed sources in the ministry also questioned the SC collegium’s non-recommendation of any names yet against vacancy of 7 judges in the Supreme Court, 290 names for High Courts and non-appointment of 4,937 judges to the subordinate judiciary. “The government is being unfairly accused of delaying appointment of judges while we have done and are doing our best. We appointed 120 judges to the High Courts this year, the second highest so far. 121 was appointed in 2013. This is against an annual average of just 80 appointments since 1990. We are saying this after pulling out records since 1990”, the source said. The ministry’s clarification comes two days after Constitution Day heated exchanges between the CJI and Law Minister Ravi Shankar Prasad. Both had taken on one another at several public functions organized as part of Constitution Day on November 26 warning each other to stay within the confines of the 'Lakshman rekha' as drawn by the Constitution and not to interfere into respective spheres. “There are seven vacancies in Supreme Court..no names recommended yet by the collegium..one vacancy is more than a year old. Another vacancy nine months...another five months. Two of two months two more of one month. Why is the collegium sitting on them without suggesting any names”? asked the source. “You talk of 430 HC vacancies. But out of that no recommendations have come so far from High Courts for 279 vacancies. There are 4,937 vacancies of lower court judges. State or central government has no role in it but the HCs. Why they are not being filled?”, the source asked adding records also show that 32 to 35% vacancies have always been the norm. In Constitution Day comments, CJI Thakur had once again expressed his concern over increasing vacancies at various courts, including the vacancy of 500 judges in HCs and urged the Centre to intervene at the earliest in the interest of the judiciary. “What do I tell now on the issue. I have been telling again and again and repeated it various times. 500 Judges posts are vacant in the High Courts. They are not being filled. Presently, there are several vacant court rooms in India, but no judges available. A large number of proposals are still pending and hope the government will intervene to end this crisis,” CJI Thakur had said. “Several tribunals are without judges and I am pained to send my retired colleagues there. Tribunals are not equipped and no retired SC judge wants to head tribunal,” he said. Three days back, standing by its decision to refer back for reconsideration to supreme court the names of 43 candidates for appointment as judges in high courts, the Centre has said in the parliament that the decision was based on “adverse intelligence reports and serious nature of complaints” against them. Minister of state for law PP Chaudhary told the Rajya Sabha in a written reply yesterday: "The major reasons for referring back 43 recomendees to the Supreme Court collegium on the appointment of judges are views of consultee judges, views of constitutional authorities, adverse intelligence bureau inputs, serious nature of complaints received against recommendees. Out of the 43 names returned to it by the government for reconsideration, the Supreme Court collegium has reiterated its recommendation for 37, deferred three proposals while three other names are still with it”. On November 18, fresh confrontation broke out between the Supreme Court collegium and the Centre with Chief Justice T S Thakur firmly telling Attorney General Mukul Rohatgi today that the collegium has reiterated the names of all 43 judges for the High Courts whose candidature were sent back for reconsideration to the collegium by the Centre two weeks ago. The CJI had slammed the Centre for attempting of trying to bring the judiciary to a grinding halt by delaying appointment of judges, the Centre had on November 11 told the CJI-led bench that 34 judges have been appointed to the High Courts. 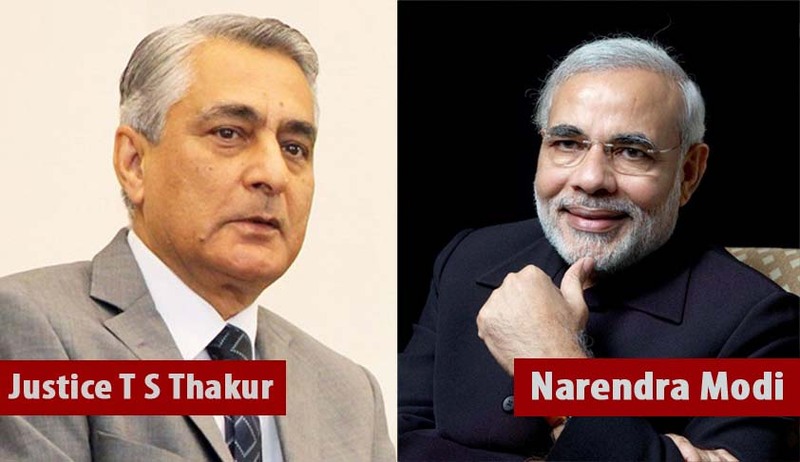 After the AG submitted a list regarding the appointments, CJI Thakur had perused it and said the collegium will meet on November 15 and a detailed order will be passed later in open court. It is to be noted that Rohatgi had in October 28 sought one more chance to “come up with something positive” on judges appointments defusing the volatile situation and preventing the summoning of the top officials of the PMO and justice ministry. "Please do not issue notice now. Kindly post it after vacations by then somepositive steps would have been taken", Rohatgi had assured after which the CJI softened down a bit earlier. "In Allahabad, out of a sanctioned strength of 165 there are only 77 judges. In Karnataka High Court, an entire floor of courts are locked because there are no judges. Once we had a situation where we had judges but no court rooms. But now there are courtrooms but no judges. You may now as well close court rooms down and lock justice out. You can have the institution called the judiciary locked”, an angry CJI had said.